If you discover the suspicious Glomatron running on the browsers and wonder what this program is about, chances are that you will firstly visit glomatron.com. This site represents the program and indicates that it can transform the web; however, it is useless when it comes to actually downloading the promoted software. 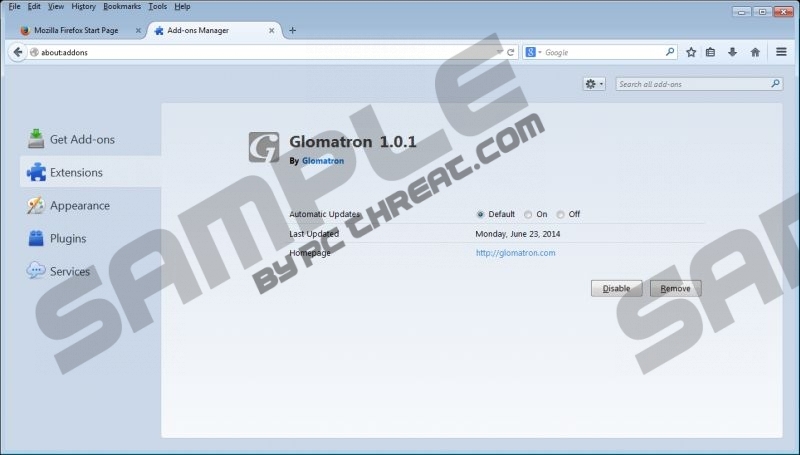 All in all, you should remove Glomatron right away, if the extension has already been installed onto your Mozilla Firefox, Internet Explorer or Google Chrome (older versions) web browsers. The fact that the application is not distributed in an official manner should worry you. Even if the installer is activated by third party software distributors, you should not trust it if you cannot install it yourself. Bundled software installation in general is not something we recommend because this practice is often related to cyber criminals who use seemingly authentic programs to camouflage the installers of malware. You could have downloaded malicious programs which require removal alongside Glomatron as well. Disturbing online advertisements are the primary attribute of Glomatron and similar adware. Even if you are clueless about the existence of advertisement supported programs, it is likely that you will suspect it as soon as you face different ads promoting different services and pushing different offers. Note that you should remove these ads because ignoring them does no good. Needless to say, you will achieve this only if you delete Glomatron from the browsers right away. You can install automatic malware detection and removal software to remove Glomatron and ensure that no illegally distributed programs and camouflaged threats can attack in the future. This is the best option you have because the manual removal is more complicated and has more steps. If you use the instructions below, you will also need to delete the remaining registry entries and possibly certain files. On top of that, the bundled software installed with adware may also require removal. Access the Metro UI menu (tap the Windows key) and right-click. Select All apps. Select Control Panel, go to Uninstall a program and find the unwanted software. Right-click and Uninstall unwanted programs one at a time. Quick & tested solution for Glomatron removal.